Click to read or listen to the two-minute review. I’m reading with Willy Vlautin tomorrow night in Eugene as part of his release tour for his new novel Don’t Skip Out On Me. We’ll be at The Foundry, Sam Bonds on 8th, at 7PM. Willy was in London last week, and Portland last night (reading at Powells). He’s one of my favorite authors and an incredible reader. Come check us out if you’re free! Vote For The Teen Choice Awards – Too Shattered Nominated! 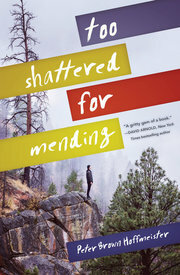 I just found out that Too Shattered For Mending has been nominated for the 2018 Teen Choice awards because of its starred reviews. This is the book equivalent of the top-200 Billboard songs at the end of the year. Voting starts now and goes through the start of February. If you liked the book, please vote. Also, please share this link with your friends on Facebook and Instagram. I need teens to help promote. Would anyone mind helping me spread the word? This is the second installment of four book trailers for my new novel, each featuring a different character from the book. Trailer #2 features Big, Little’s grandfather. We’ve decided to release four book trailers for my new novel, each trailer featuring a different character from the book. Trailer #1 features Rowan, JT’s girlfriend and also the girl that Little (the main character) is in love with.